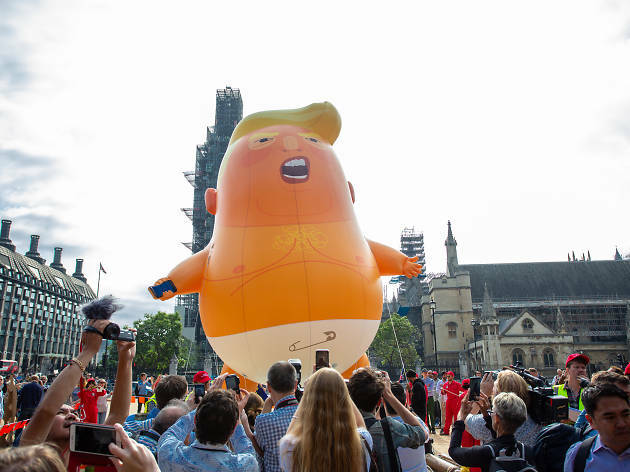 During President Donald Trump's first state visit to London earlier this year a group of protestors created a gigantic balloon caricature of the commander-in-chief, depicted wearing only a diaper and clutching a cell phone. 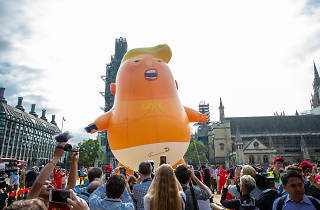 The 20-foot-tall balloon floated over a crowd of 100,000 protestors in Parliament Square on July 13, 2018 and has since been replicated so that “Baby Trump” could fly over the Trump National Golf Club in Bedminster, New Jersey. The balloons are currently on a tour of the U.S. that kicked off in West Palm Beach, Florida on September 22, the one-year anniversary of Hurricane Maria. A “Baby Trump” balloon is scheduled to fly over Chicago for the first time on Saturday, October 13 during the March to the Polls event being organized by Women’s March Chicago. Organizers have launched a GoFundMe campaign to help cover the costs of bringing the inflatable to the Chicago. The balloon will lift off (weather permitting) at 9am when the rally begins in Grant Park, where attendees will be able to listen to guest speakers and live music. Later in the day, the event will take to the streets, marching to Federal Plaza where attendees can take part in early voting and registration for the 2018 midterm elections.